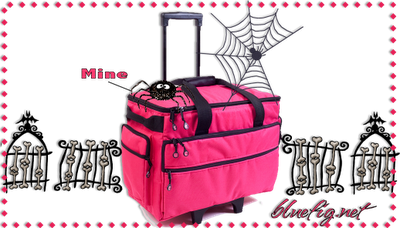 Congratulations to Cherise one of Annie's Ghastlie fans who won this beautiful BRIGHT PINK wheeled sewing bag from Blue Fig. I know what's going on my Christmas list (hint, hint!) Keep hopping, there are more giveaways each day! My sincere and heartfelt thanks go out to all of you who took the time to comment yesterday. I read each and every one of them and have never felt so much quilting love. I hope to respond to you individually but that may take me awhile. Until then know that I was overwhelmed by your thoughtfulness. I'm definitely still suffering from the Ghastlies Fever and all today's bags inspired to pull out my stash again and put this together. The collective creativity of everyone involved in this blog hop is unbelievable. I'm truly frightened to see what else you all are going to come up with, I may never be cured! My ruffled messenger bag is a mash up of these tutorials by New Green Mama and Between the lines. For this one I added in some Alexander Henry Heath in Black and Rose Pink. If you haven't tried Heath it's a fabulous blender with just enough texture. This was a perfect cure for what's been bugging me; ) I wanted to make something special for my trip tomorrow. What, I forgot to tell you where I'll be spending the weekend? I'm going to be in Houston for Quilt Market! Eeeeek!!!! So if you spot this bag you'll know it's me and if you can't make it to market check back next week and I'll share some of the sights. I love what you created with the Gastlies fabric. Spooktacular. Travel safely to the market with your Ghastlie bag--I love it! I LOVE the bag - what a perfect use of the Ghastlies! I am definitely copying that! Have so much fun at Market! I love your messenger bag! Sew ghastlie delightful. Please tell me how to find out about things like the quilt market. I'm new to Houston and not sure how to find info on these quilting things. I always seem to hear after the fact. Hehehehe. You definitely are obsessed. Sometimes it is good to not get rid of the flu, but only if it is of the Ghastly kind.